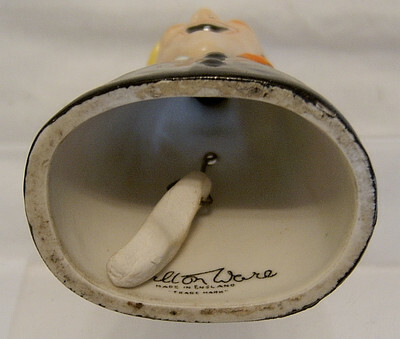 Carlton Ware produced a small range of Novelty items in the form of a bell with a variety of characters housing the bell clanger. This one is 'The Dandy' and is rather difficult to find these days. He stands 4.5 inches (11.5 cms) tall and is in perfect condition. There are no chips/nibbles/restoration. The black paint on the back has faded just a little though this can only be seen in bright light. It has the Carlton backstamp on the inside (partially obscured by the clanger! ).